Greenville, South Carolina, frequently makes headlines as one of the best places to travel in the nation. In 2017 alone, Greenville was included on the New York Times’ 52 Places to Go in 2017, Conde Nast Traveler’s Top 5 Places to Retire, and US News & World Report’s Top 5 Places to Visit in September. South Carolina is one of the most business friendly states in the nation. The state offers one of the lowest corporate tax rates (5%) and a variety of state statutory incentives including no state property tax, no local income tax, no inventory tax, and many other statutory and negotiable incentives provided by the South Carolina Department of Commerce. At a local level, Greenville was ranked the third most business friendly city in the state, and Upstate cities including Greenville filled seven of the slots on the Top 10 list produced by the Palmetto Promise Institute. 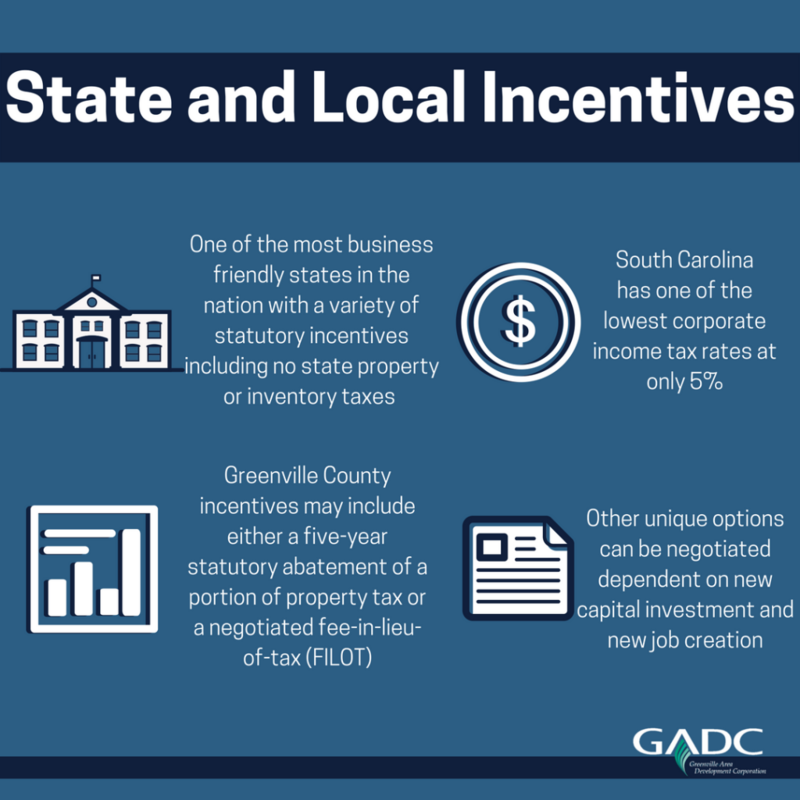 Greenville County provides further incentive programs based on total investment, and companies may be eligible for either a five year statutory abatement of a portion of property tax or a negotiated fee-in-lieu-of-tax (FILOT) arrangement. As the County’s agent for economic development, GADC has the sole ability to negotiate property-tax based incentives. Let us work with you to negotiate the best incentive package for your business. The Upstate has a highly trained and well-educated labor force. The US Census Bureau reports that 86.7% of Greenville County residents over the age of 25 have a high school degree or higher, and 32.1% of residents over the age of 25 have a bachelor’s degree or higher. South Carolina is a right-to-work and employment-at-will state with one of the lowest unionization rates in the nation. The Greenville Metropolitan Statistical Area has a unionization rate of only 0.9% in the private sector. The Greenville area is home to an award winning public school system and more than a dozen institutions of higher education, including Clemson University, Furman University, and Bob Jones University. 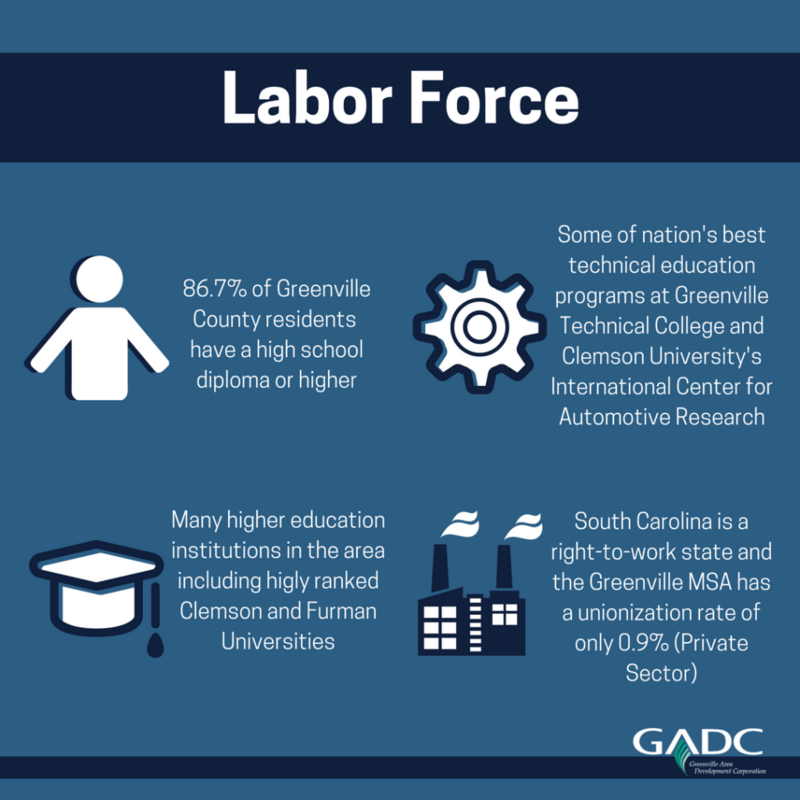 There is a strong technical education sector with Greenville Technical College and the Clemson University International Center for Automotive Research. The area also benefits from statewide workforce training programs such as ReadySC and Apprenticeship Carolina. 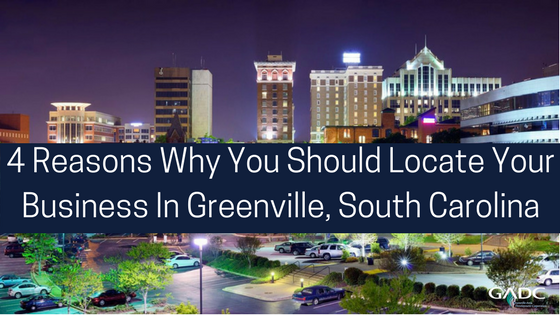 With a wide array of educational backgrounds, a low unionization rate, and a high growth rate, Greenville will have qualified candidates to fill jobs at every level of your business. Greenville is located on the I-85 corridor directly between Atlanta and Charlotte. I-85 is an important interstate for regional commerce, and Greenville is strategically centered for access to the entire Southeast. According to StatsAmerica, approximately 25% of the total US population lives within 450 miles of the Greenville Metropolitan Statistical Area. The Greenville-Spartanburg International Airport (GSP) is the largest airport in South Carolina, and has direct flights to 14 major cities including Chicago, Philadelphia, Washington DC, Detroit, Dallas and Newark. For longer flights, major international airports in Charlotte and Atlanta are only 100 and 150 miles away, respectively. The Upstate has an excellent network of state and locally maintained roads, as well as major highway infrastructure for area transportation needs. 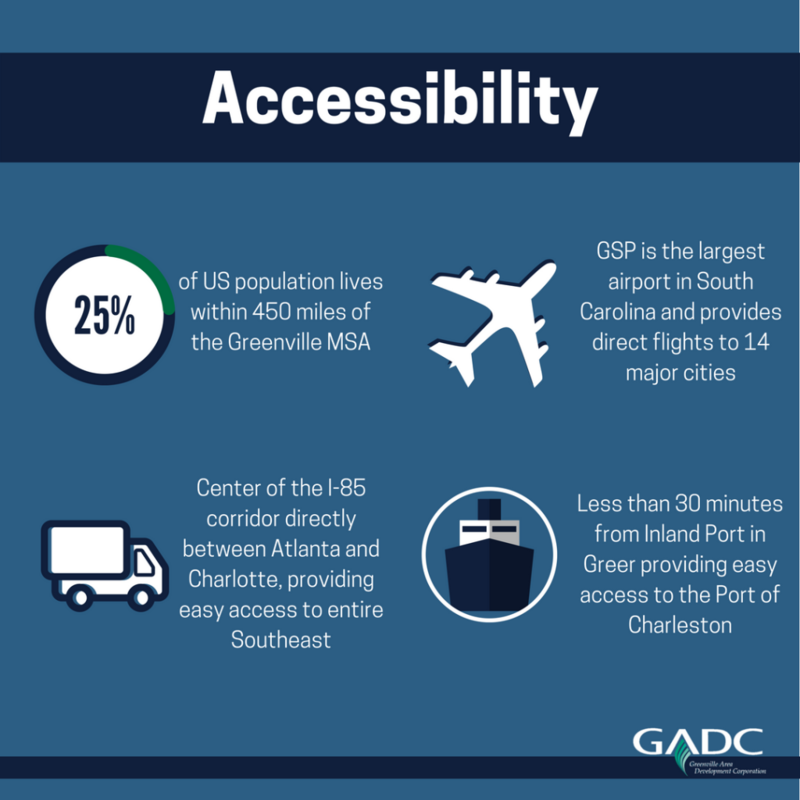 Greenville is less than 30 minutes away from the South Carolina Inland Port in Greer, providing efficient access to the international Port of Charleston. Greenville’s strategic location and substantial infrastructure make it an ideal base to access markets in the Southeast and around the globe. amed for its Southern hospitality, Greenville is a great place to call home. Greenville offers top tier restaurants, a variety of arts and entertainment venues, and easy access to beautiful natural places, all for a cost-of-living well below the national average. Greenville’s 2016 Cost of Living Index as calculated by the Council for Community and Economic Research was 93.7, below the national average of 100. This affordability does not mean a loss of amenities, as Greenville is quickly gaining a reputation as a foodie’s paradise and an artist’s haven. Annual events like the award winning Artisphere or popular summer series Main Street Fridays contribute to the vibrant community spirit. For those looking to get out of the city, Greenville is nestled in the foothills of the Blue Ridge Mountains and is only a short drive away from the best of the Appalachians. If you prefer coastal living, Charleston is only 3 hours away with historic landmarks, delicious cuisine, and beautiful beaches. 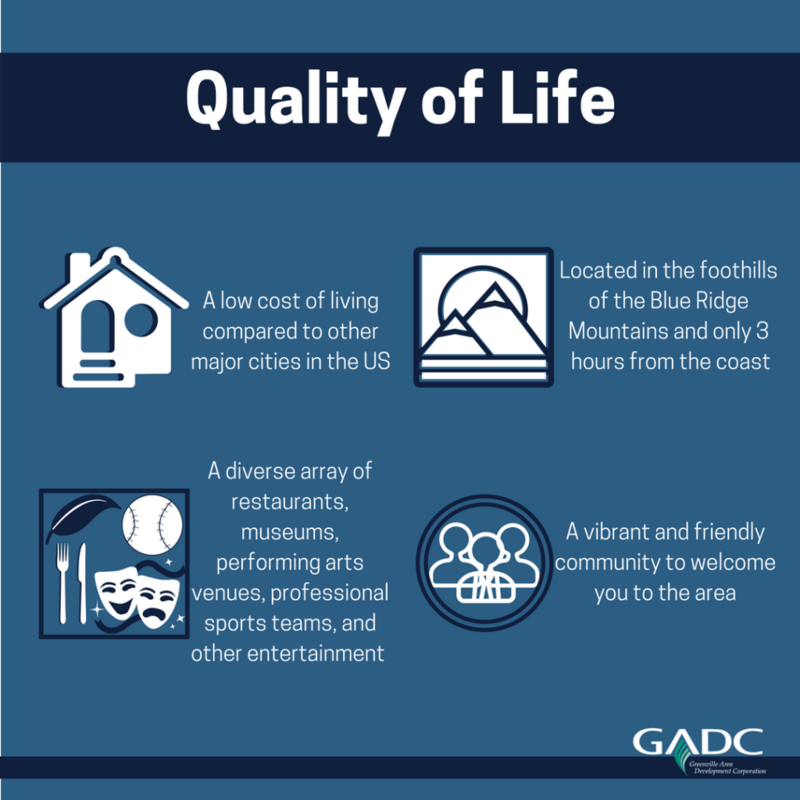 Greenville is a growing city with a bright future, and GADC would love to help your business become part of the story. Our staff looks forward to welcoming your business to Greenville and making your transition as smooth as possible. Please call us today at 864.235.2008!